Despite our catastrophic experiences with the Onkyo DAB CD unit, we'd developed a taste for DAB radio/CD combos so were right on Pure Digital's case when they announced their new DAB/FM/CD/MP3 micro system, the DMX-50. 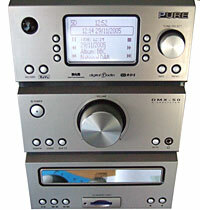 Perhaps better known for their distinctive portable sets, Pure are a world-leading, UK-based DAB radio retailer, with a reputation for innovation. Rolled out just in time for Christmas, the �230 ($395, �336) DMX-50 is an attractive 40W RMS micro-sized system, cunningly disguised to look like three hi-fi separates. Finished in a pleasant grey metallic finish, the unit is dominated by a large, five-line LCD screen which provides DAB/FM radio station information, scrolling DAB digital text, CD/MP3 track listings and access to a variety of user-selectable options. Context-sensitive buttons either side of the display provide a simple user interface offering fast access to relevant features - it's one of the best interfaces we've seen. Setting up the DMX-50 was an absolute breeze - no sooner had we got the thing plugged in than it was busying itself automatically locating and storing over 50 DAB stations within range. Nice. Locating FM stations was equally swift and painless, with the large, intuitive interface making it a breeze to find, sort and order presets - kudos to Pure for simplifying a process that can sometimes turn grown men into fist-shaking balls of frustration. Playing CDs was straightforward enough too, although the CD tray was a little too flimsy for our liking. We especially liked the fact that it displayed both CD and MP3 track and artist information onscreen, making it easy to find tracks. A unique feature to Pure is the ReVu function, which lets you pause and 'rewind' live DAB digital radio, courtesy of a constantly updating 20 minute buffer. This means that it's possible to rewind back to the start of a show you may have missed the beginning of, or pause the radio to take a phone call. DAB digital transmissions can be recorded (or played back) on the built in SD card slot, and a USB port lets you play back and transfer recorded files to your PC. The USB connection can also be used to download software upgrades for the DMX-50. Further connections come in the form of a pair of spring loaded speaker clips, two aux inputs (for plugging in an MP3 player, for example), an optical out and a Line/Sub Out for hooking the unit up to an external amplifier or connecting a sub-woofer. The package is rounded off by two stylish Rosewood speakers with 5�" woofers, and 19mm Mylar-dome tweeters, a simple remote control and aerial. Quick to set up and a pleasure to use, Pure's straightforward interface, massive LCD and impressive feature set make this a great player for music fans who don't fancy wading through hefty manuals before they can start listening to tunes. At this price level we weren't looking for high-end hi-fi quality, but the DMX-50 gave a good account for itself and was a pleasure to listen to. The bass output perhaps wouldn't excite dub aficionados, but when cranked up, the sound was beefy enough to encourage a bit of air guitar work around the office. Throw in CD/MP3 text, a SD slot and the unique ReVu feature and you've got the best all-round DAB/CD player we've come across so far. Amplifier: 40W RMS per channel power output (into 8 Ohms @10% THD+N, A-weighted). 10 Hz to 40 kHz (-3dB) frequency response. Bass and treble tone control. CD player: CD-R and CD-RW playback compatible. Support for CD Text and 20 track audio CD playlist. Multiple playback modes (repeat, shuffle, etc.). MP3 playback, including support for ID3 tags and M3U playlists. DAB: PURE ReVu� enables pause and rewind of live DAB digital radio. Full Band III (174 - 240 MHz) reception. Fully compliant with ETS 300 401 and capable of decoding all DAB transmission modes 1-4. Fast autotune feature. 99 presets. FM: Supports RDS and RadioText. Tune by RDS station name. 87.5-108 MHz frequency range. 99 presets. SD card: SD card slot for recording DAB radio to SD card. Speakers: 8 Ohms (nominal) impedance. 40W RMS power handling. Polypropolene mid-bass drivers. Two-way rear ported enclosure. Custom-tuned 2nd order crossovers. Connectors & Cables: 3.5 mm headphone output on front panel. RF F-connector 75 Ohms for combined DAB/FM aerial connection. Two separate dual phono line-level audio inputs for auxiliary device connection. Dual phono for stereo analogue line-level output. Optical Toslink connector for digital S/PDIF output (IEC958 @ 48 kHz). USB connector for future software upgrades and SD card access. Stereo spring-clip terminals for speakers. Integral mains cable with Euro/UK adapter. Bootlace DAB/FM aerial and two 3m speaker cables supplied.